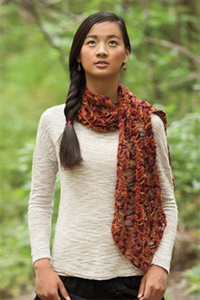 Crochet the popular Rudens Scarf with this kit, complete with Lorna's Laces Shepard Sport yarn in Verve or Tahoe. Crochet the popular Rudens Scarf designed by Linda Skuja from the Interweave Crochet Fall 2013 issue with this kit that includes the pattern and yarn. Choose from two colorways of Lorna's Laces Shepard Sport yarn. Order your Rudens Crochet Scarf Kit today! From the Interweave Crochet Fall 2013 issue, this popular scarf is a quick-to-crochet accessory that incorporates handpainted yarn with a fun crochet stitch. Latvian landscapes of rudens, a Latvian work for "autumn," inspired this scarf worked in a wavy stitch pattern. This symmetrical scarf is started in the middle and worked out toward both ends. The outer leaf pattern is extended at the very end to form a triangular edge that mimics the falling of leaves. 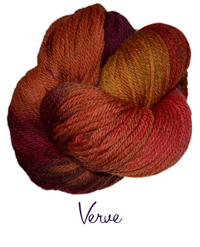 Three skeins of Lorna's Laces Shepherd Sport yarn in either Verve (as seen in the magazine) or Tahoe. This 100% Merino wool yarn is both soft to work with and to wear, plus it is washable! 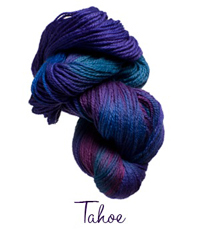 This kit offers enough Shepard Sport yarn to crochet one Rudens Scarf in either Verve, as seen in Interweave Crochet Fall 2013, or Tahoe, a blend of blues and purples. Colors may vary slightly from what is seen here.